VIDEOS – ( video clips, editions of corporate videos, wedding, corporate image for televisions). EDITORIAL- (assignments for magazines, catalogs, fashion publishing, jewelry, objects, etc. OUR STUDY - space also, you can rent. Specials photo revelations, RECOVERED FROM ANCIENT PHOTOS, IMPRESSIONS, etc:- We advise and manage, positively presented in different media - traditional, trends, different styles, canvases, etc. Digital album:- Formated for us - printed both in Spain and in Italy. DIGITAL PHOTOGRAPHY COURSE - Beginners and Advanced. PHOTOSHOP COURSE - Beginners and Advanced. WORKSHOPS - field days (shooting) - both in the studio and outdoors. LIGHTING WORKSHOPS - In Studio. More than 25 years dedicated to the image we love to meet the challenges of each assignment, taking into account all the nuances, arguments and desires of our customers to get the best results we all want both client and study. All services offered in Studio Madison has full flexible hours, always with a budget, and adapting to the needs of our customers. We have latest equipment and work with brands around 1, both cameras and lighting, edited with the best programs and are always pending updates. For domestic producers / international :- Coordination hosting, catering and outdoor and indoor locations, productions, including the possibility of renting the studio and equipment. CEV studies (Center for Visual Studies) in Madrid (93-95) specializing in advertising photography. Course creative processes analog and digital photography, the photographic image and document editing (Cadiz University 2013). Specialization Course in Contemporary Photography (CAC Málaga) 2012-2013. We are at your service, We best quality, we try to adapt to budgets. Quality services and optimal prices. We are one of the few professionals with a study of 160 mts. square at the site of Marbella, where we make big productions and create amazing images, creating stage sets, special effects, characterizations and everything that imagination asks you. The photographer will be a Maximum of 8 hours ( Always hours continuous). Our space is now also Cultural. Our space also for exhibitions, Events, micro Theater, talks, Releases, Home, Live music. 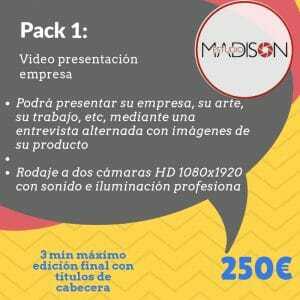 PACKS – VIDEOS deals – Prices without VAT. Everything is possible. If you can imagine, can you do.